WASHINGTON, DC –(ENEWSPF)–July 28, 2016. Today, the Sierra Club released its new “Stop Toxic Trade Deals” video on the dangers two massive proposed trade deals — the Trans-Pacific Partnership (TPP) and the Transatlantic Trade and Investment Partnership (TTIP) — pose to our air, our water, our communities, and our climate. The video, created by Sierra Club Productions and narrated by Golden Globe-nominated actress Evangeline Lilly (Lost, Ant-Man, The Hobbit), features footage from recent climate victories — including the Keystone XL pipeline rejection which has become the center of a $15 billion trade case against the U.S. thanks to rules in the North American Free Trade Agreement that would be expanded in the TPP. The new video, which encourages viewers to call on their member of Congress to oppose the TPP and features the hashtag #StopTPP throughout, is set to premiere at the Rock Against The TPP concert tour stop in San Diego this Saturday, July 30. The Sierra Club and other environmental groups have long fought trade deals that threaten climate progress, most recently sending Congress a letter signed by more than 450 organizations calling on Members to commit to vote against the TPP and to demand changes to TTIP, marking the largest display of opposition to the environmental impacts of toxic trade deals. Environmental groups also delivered more than half a million petitions denouncing the TPP for its environmental failings earlier this summer, a powerful moment featured in today’s new video. 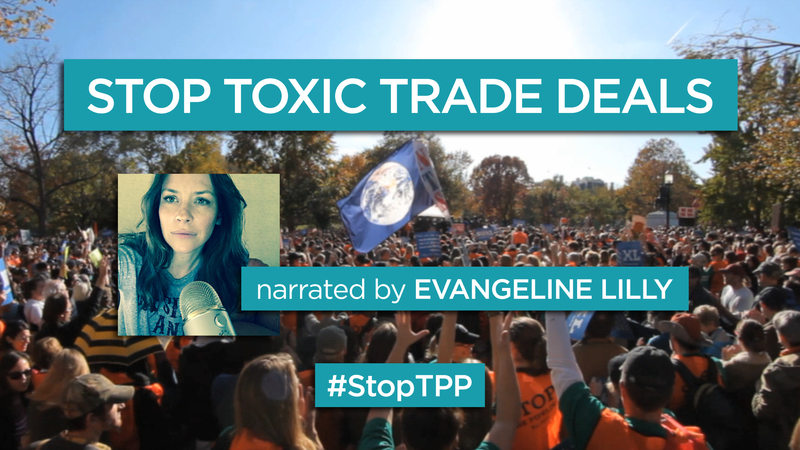 After premiering “Stop Toxic Trade Deals” Saturday in San Diego, the Sierra Club will feature this video at fair trade rallies and events across the country throughout the year to help ensure the TPP does not come before Congress. You can watch the video here.